Duct Tape has gone main stream and Duck Brand adhesives dragged it kicking and screaming there. When I was in High School I was mocked for my liberal usage of the Classic Silver 3M Duct Tape to keep my pair of steel toed boots wearable. It is quite likely that anybody doing the same thing in a High School today would also be mocked, but according to MTV Style the Duck Tapes Prom Dress Contest was the 13th hottest trend of 2010. So while you may still be publicly shamed for attempting to use Duct Tape as part of your day-to-day wardrobe you can at least be confident that MTV has got your back when it is time for Prom. As you can see the people at Duck Brand would prefer you turn your tastes more toward Project Runway and further from Red Green's styling. Of course these folks aren't going for the straight forward silver tape of old, but taking advantage of the multitude of colors available. If you are planning on entering the contest this year you probably missed the deadline by the time you are reading this (so go read the official rules). Fortunately, they have taken to holding this contest annually so you should be able to enter next year or the year after that. You'll want to mark it down on your calendar. 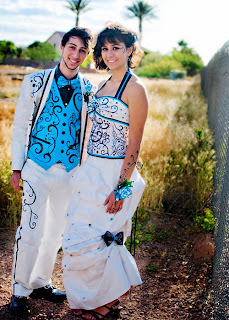 If you are going to be creating a piece of fashion that you'll only be wearing for a few hours go ahead and buy whatever color tape you want. That's the important part anyway. If you are going to be doing something like actual construction or you know, actually taping ducts you need some primo quality tape. 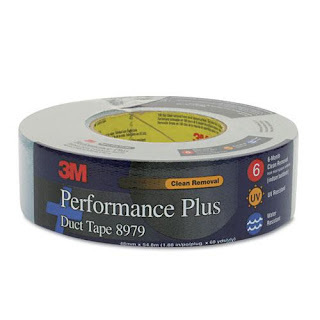 Enter 3M's Performance Plus Duct Tape. I don't want to spoil the surprise for you so just go ahead and read the product description.